This is a German food truck of some kind. I’m not exactly sure what they sold here, but it seems to be part bakery, part food. I love these custom Vanagon builds. 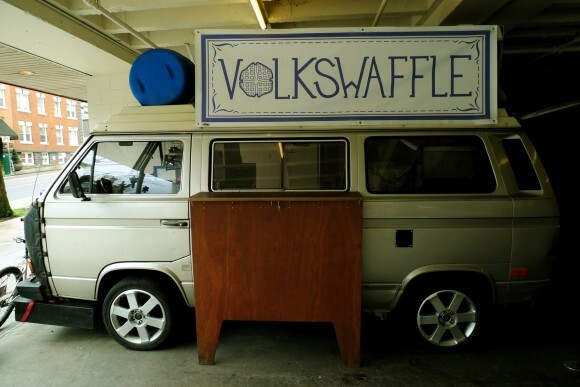 It doesn’t really matter what the specific use is, people are pretty creative when custom building a Vanagon. Click through for more pics. This early 1980s air cooled Vanagon serves as an ice cream truck. No matter the age, these Vanagons make great food trucks. I just wish we had more of them in the States. All of them appear to be in Europe. This one appears to be from Belgium. 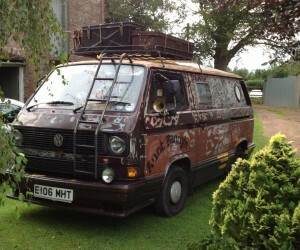 All it needs now is a set of GoWesty wheels and it would look fantastic. 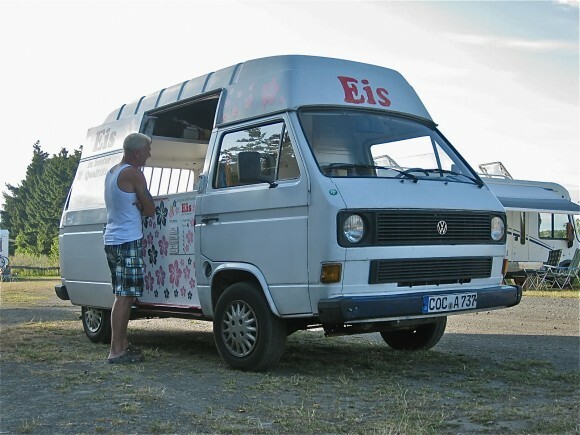 We have seen a Vanagon Ice Cream Truck before, but this ice cream truck was found in Germany. I could only find one picture of this van, but you get the idea. I wish we had these where I live! 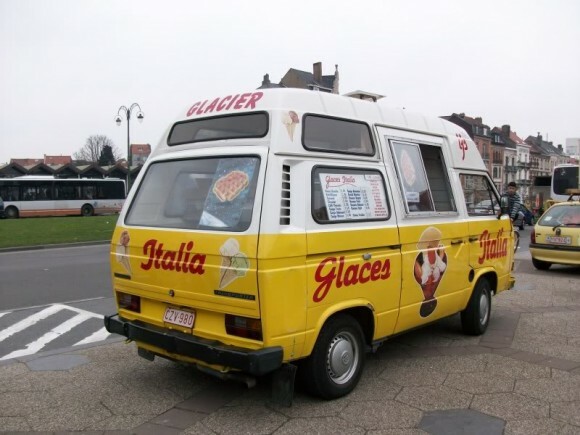 We finally got a look at a Vanagon Ice Cream truck. 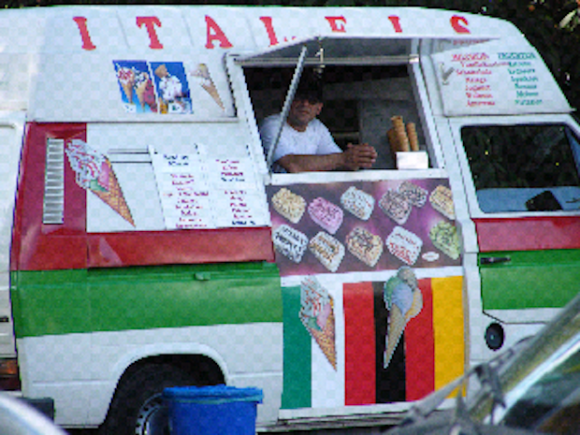 We have seen other Vanagon food trucks before, but this is the first ice cream truck. This one comes courtesy of Flickr, and it looks great. 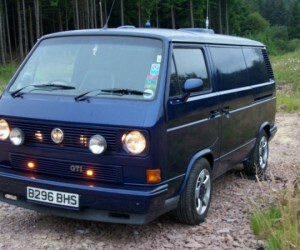 This is an early 1980s T3 Transporter with a high top. The sliding door even cuts into the top providing lots of room. Click through for a couple more pics. 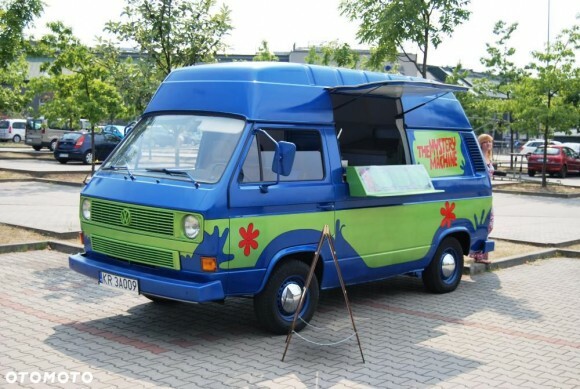 One of the favorite themes of Vanagon owners is the famous Scooby Doo Mystery Machine. We’ve seen a lot of Mystery Machines, and a several food trucks, but this is the first high top Mystery Machine themed food truck we’ve seen. Click through to see more of this gorgeous van. Whoever owns this van has taken the first class route with special attention to details. 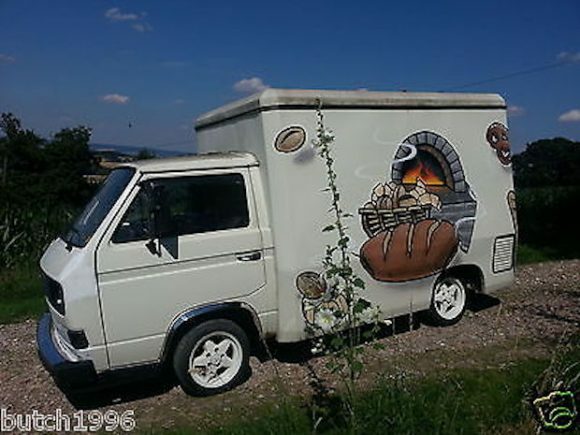 Check out this Vanagon food truck. 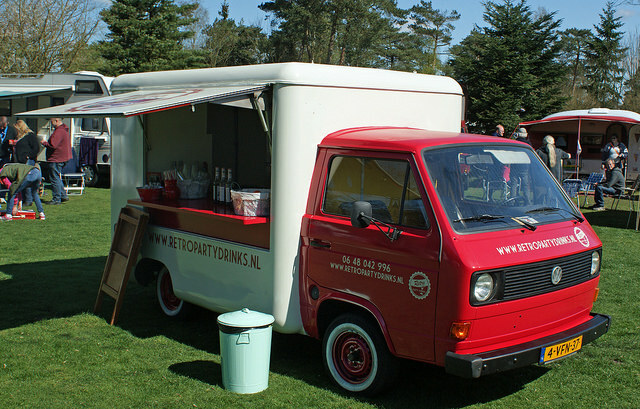 Retro Party Drinks is a company that offers its van for parties, weddings, or other gatherings in its early 1980’s conversion truck. Aside from the paint job and special rear cab, the truck has extra wide side mirrors to get around that extra large rear. The company serves classic cocktails, lemonade, punch, wine or champagne at your special event. Too bad someone hasn’t created one of these in the states. This one is in the Netherlands. We have seen several Vanagon food trucks around the world. 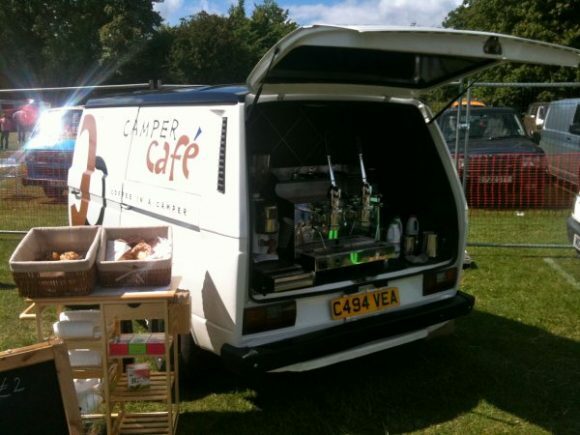 From lunch wagons to mobile cafes, the Vanagon has been adapted to fit a variety of needs. This conversion is really extensive. The Volkswaffle is a first class Vanagon conversion that has a ton of equipment on board. I wish I knew who created this bad boy, but we will just have to admire it from the pictures. Food Trucks and lunch wagons are hot right now and the Vanagon is not to be left out. The Borco-Höhns Verkaufswagen has not hit the states, but there are several variations overseas. 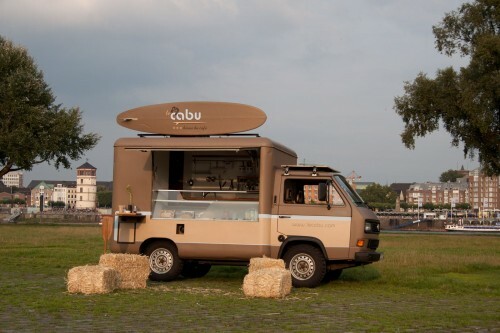 Le Cabu is a mobile cafe in Germany, and I wish he could pull up in my neighborhood. Le Cabu has a surfboard on top as the signage, and it looks like he has a solar panel above the cab to recharge his batteries. Inside, he has everything you need to run your cafe. More images after the jump.